Place shrimp into a large mixing bowl and set aside. Combine cumin, curry powder, ginger, cayenne, lime juice, honey, and 1/4 cup oil into another mixing bowl and whisk together. Pour over shrimp, season with salt and pepper and mix together until shrimp is fully coated. Cover with plastic wrap, refrigerate and allow to marinate for 1 hour. While shrimp marinates, combine all ingredients for simple cucumber salsa into a medium mixing bowl and toss together. Set aside. Heat a grill or grill pan to medium high heat and brush with remaining 2 tablespoons oil. Place shrimp onto grill or grill pan, season with salt and pepper and grill on each side for 4 to 5 minutes or until just cooked through (be careful not to overcook shrimp or texture will be tough and rubbery). Remove from heat and allow to cool for 5 minutes. 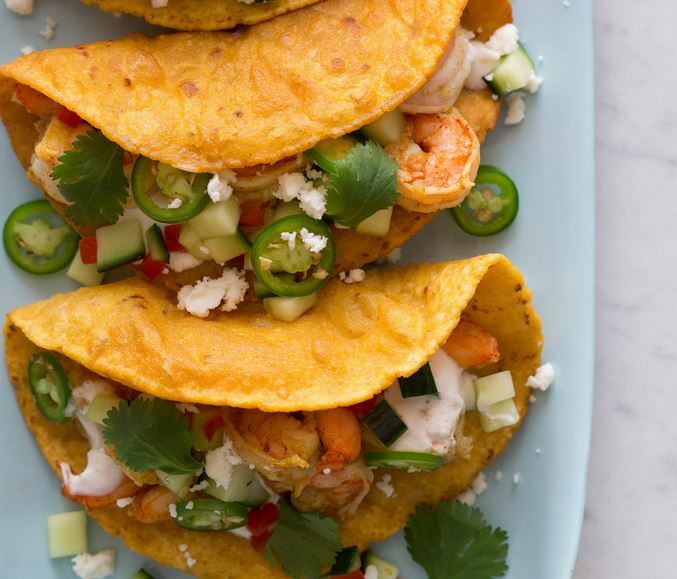 Stuff shrimp into crunchy taco shells and top with the cucumber salsa, sliced chiles, fresh cilantro, crema, cotija, and a fresh squeeze of lime juice. Serve immediately.